One of my ongoing goals is to become a better painter. I have the fortune of being able to get in person advice from GitSmack and Antman677 on www.DakkaDakka.com. I read various magazines, such as Fine Scale Modeling and Military Modeling. I also keep up on a number of painting blogs, such as The Painting Corps, Scale Model Medic, and was recently introduced to Ankaranseth's Blog. Unfortunately, I am color-blind (red/green), but I have found ways to compensate for this by choosing the correct color pallet. I am still skeptical that I will ever become "great," but I do know that if I do not learn, practice, and apply, I definitely will not improve. I have already seen improvements in my painting over the last two years, and so I bring hope to those that also seek to improve. As a result of my learning, I have found that many of the masters employ the use of an airbrush. I already owned and used airbrushes for my basecoats in the past, but after watching some videos and reading the magazines, I figured it was about time to step up and push towards the next level of improvement. As with most skills, the better the tools, the more room for growth and efficiency. 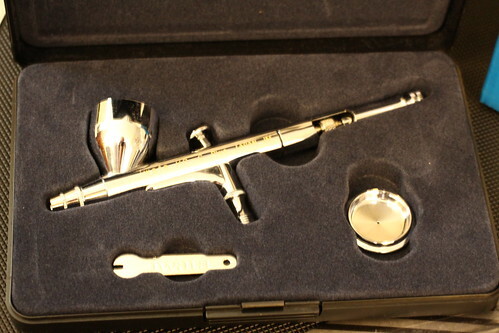 This pointed me in the direction of upgrading my airbrush. There were two options I was considering, based on the recommendations of some of the painters I have followed. These were the Harder Steenbeck Infinity Solo and the Iwata HP-C Plus. 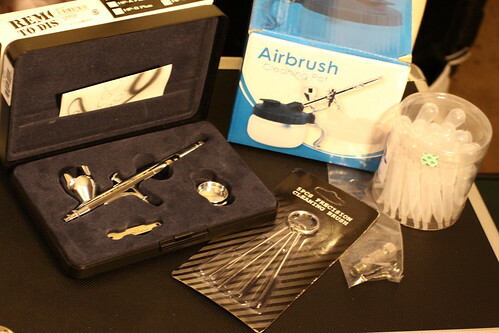 After some additional research, I found that both were great airbrushes, with the Harder Steenbeck Inifity Solo having a slight edge in precision and upgrade options. However, I found that slight edge did not make it worth the price difference between it and the Iwata HP-C Plus, which was still a significant upgrade for me, but still a good value for my pocketbook. I hope to post the results of my initial endeavors with this new brush soon. 0 Response to "Painting: AbsoluteBlue's New Toy, an Iwata HP-C Plus"